John Lynch, our day-to-day operations manager, was named one of the "60 Coolest People in Food and Drink" two years in a row by the Daily Meal - one of the world's leading sites for culinary content. Attorney with state regulatory, labor, and economic development experience. Attorney and former Director of the Ohio Liquor Control Commission. Business development strategist with decades of experience in operations. If you invest, you're betting Rambling House Cocktails will be worth more than $2M in the future. Super soft Rambling House Cocktails tee-shirt. Rambling House Cocktails engraved copper mug. Investor-only bottle from a test batch of our soon-to-be released Kentucky Mule. Limited edition vinyl record featuring a compilation of live performances from the Rambling House over the past five years. Pressed just for this Wefunder raise - we'll also be creating jacket artwork specific to the Mule! Sold over 19,000 bottles in our first year selling hard soda. Stocked in more than 200 stores in Ohio, including almost every Kroger in the state. Signed with Southern Glazer's, the largest wine and spirits distributor in the U.S.
We were the first ever ready-to-drink cocktail in Ohio. Went through more than 10,000 pounds of fresh ginger to create a ginger beer recipe that balances sweetness with a spicy kick. Founder John Lynch was named one of the "60 Coolest People in Food and Drink" two years in a row by the Daily Meal. 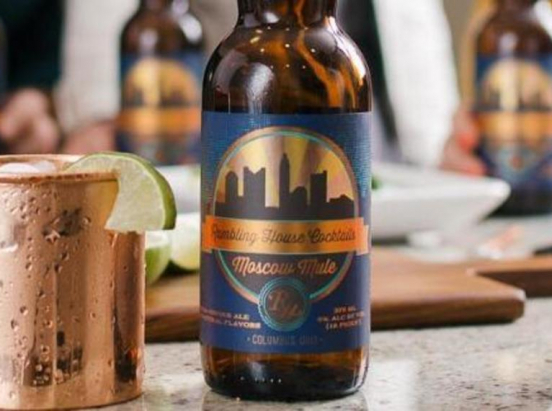 Our Moscow Mule is naturally gluten-free, low-calorie, and priced to compete with mixed drinks and wines.